You don't even know how EXCITED I am today! 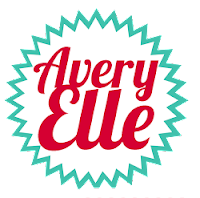 I get to blog hop with some of my favoritest gals EVER, the 2012 Gallery Idol gals! Last July we hopped with a summer theme and we had so much fun, we knew we would do it again! So what better occasion to hop than Valentine's Day? No more wasting time chatting, let's get to the cards! This first card ticks all the boxes for me! Die cuts, check. Vellum, check. Bright colors, check. And that Hero Arts background stamp? That was love at first sight! Here's how it came together. I stamped the spotty background twice (once in red, once in pink). For the sentiment, I punched 4 squares from gray card stock and rounded opposite ends. Then very carefully using a scrap piece of paper to keep the ink in check, I blended various colors of Distress Ink over each section. After I pulled off the mask (love that part), I stamped the beautiful sentiment over it all. For crisp stamped sentiments, I suggest using Versafine ink (great for detailed stamps, just don't use them with Copics). I really love how vibrant the colors came out! The second prize I have to offer is sponsored by Fresh Squeezed Stamps! One lucky winner will receive their Punny Valentine stamp set! I'll be picking the 2 winners at random from all the comments left on this post from today until next Thursday, February 21st at 11:59 pm EST. I'll announce the winner on Monday, February 25th. BIG THANKS to everyone stopping in today! And a huge THANK YOU to our generous sponsors! The response has been incredibly overwhelming and all of us gals are just so excited and grateful! What a cool idea! I'll have to try the roll tape for sure!!! Awesome cards, JJ! Love your vellum backed letters. That masked heart card is phenomenal! You never cease to amaze me! Such gorgeous cards! JJ! These are awesome!! I love that bright coloured segmented heart, but it's that first card with that awesome background that really got me!! Awesome creations!! Awesome cards! Love the masked heart one and the directions for making it! Happy Valentine's Day!!! wowee - that masked heart is awesome! Both of these are fantastic! I especially love how you put the vellum behind the L, V and E! Great work!! incredible! I love your tutorials, always sticking a roll of tape in there!!! What fun cards! I love the Hero Arts background - great inspiration! You had me at vellum! That segmented heart is a killer, too! WOW! Both are GORGEOUS - but I especially LOVE that beautiful heart! It is so striking!!!!! I'm really liking that heart!! JJ both of your cards are so fabulous. Those die cut letters backed with vellum--swoon and that fabby rainbow heart. Always love your creations. LOVE both of your cards! The vellum behind the die cut letters look SO SO amazing!! I too love post-it label and distress inks! And you have used them spectacularly in your heart card!! Awesome cards, JJ. I really love the heart. Looks like a lot of work and it turned out great. (BTW, I must live in a cave. I didn't know that post-it came in a tape roll. Thanks for sharing). Love both of these amazing cards!! this is such a great idea! i didn't know you could get that post it tape! Love the beautiful colorful card! gorgeous! I love that rainbow heart! I love the first card but the 2nd one blew me away. Wow. How creative. Love how colorful the heart turned out. Oh what darling cards. Love the dotted background and that you used two colors. And the vellum use is so creative. 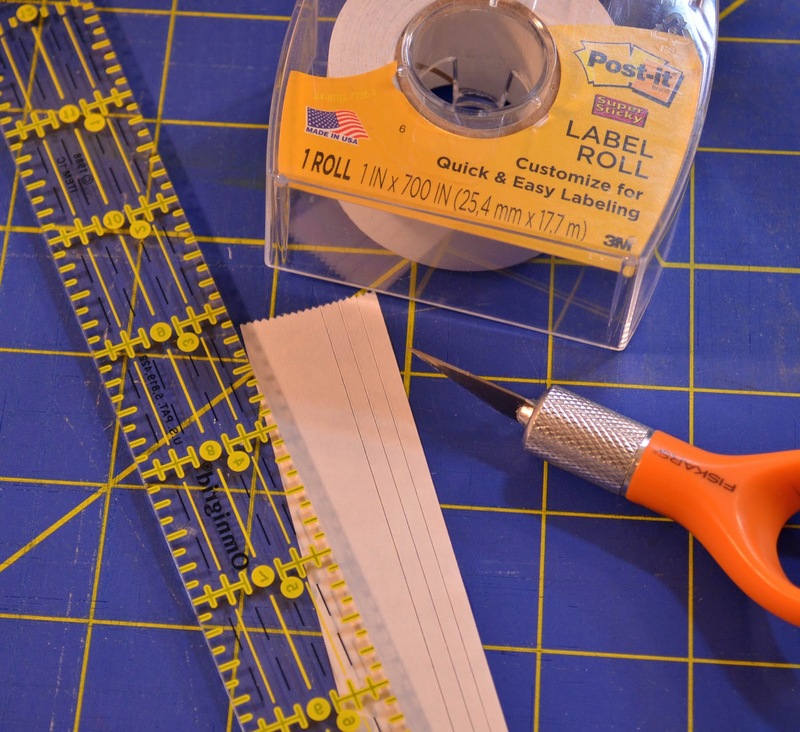 Never heard of the post it tape, but it could be so useful in my crafting. Thanks for sharing. Fantastic cards, as usual! Love the sentiment on the first one and the bright, happy colors of the second one! Ohhhhh! These are awesome JJ!! 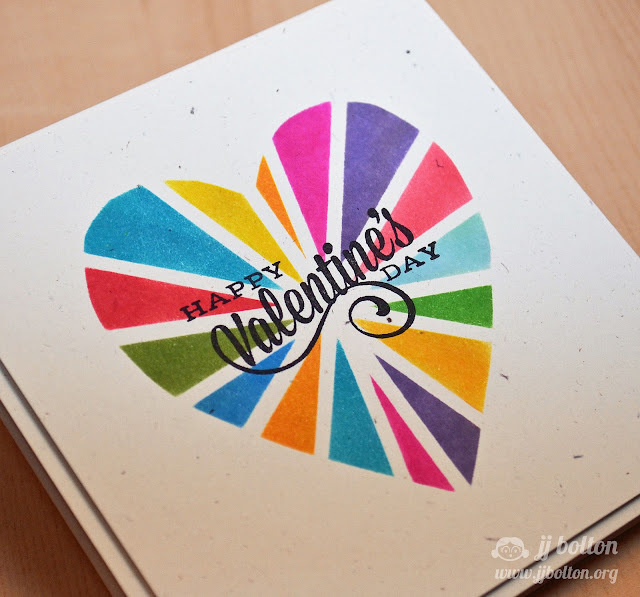 I love the spotted background and how you use the negative space of the letters in your first card and your rainbow heart just makes me smile (I LOVE color!). Happy Valentine's Day! That's really cool! I definitely want to try that. Ooooooohhhh - such pretty cards - simple yet beautiful! Love how you put the heart together! LOVE both of the cards. AMAZING. Happy Valentine's Day. So arsty! I just love the rainbow heart! Goodness--these are both amazing. And, I have the roll of post it tape, from the last time you told me to buy it. Yay! Stunning cards, love your masked heart, such a genius idea!!! Beautiful cards! Love that rainbow heart! Thanks for showing us that awesome rainbow heart and how to do it! That is awesome. I love the rainbow heart. I can't believe how perfect the lines came out. I seem to always have the ink bleed. I may have to get some of that tape. Both cards are fabulous, but I love that first one with the letters. Gorgeous! Great cards. Love the heart. Thanks for sharing. That heart is fantastic, but I do LOVE the first one too! Ah-mazing cards as always! Love the vellum goodness and must get my hands on that Post It tape! Happy LOVE Day! I am in love with the color wheel heart! Wonderful card! AWESOME!!! Love your work, JJ! Today's cards are outstanding as always! Happy Valentine's Day! I love these JJ!!! So fun, especially that heart! You are a masking genius! Great cards. I have never seen the roll tape before but will be on the hunt for it now! And I too just came to the realization yesterday that I didn't have heart dies! I need to fix that! Beautiful cards!! The heart rainbow card is so cool!! I ♥ your rainbow heart! Thanks for doing this...I hope I win one of the giveaways!!! That colored heart is pretty way dang amazing, JJ! 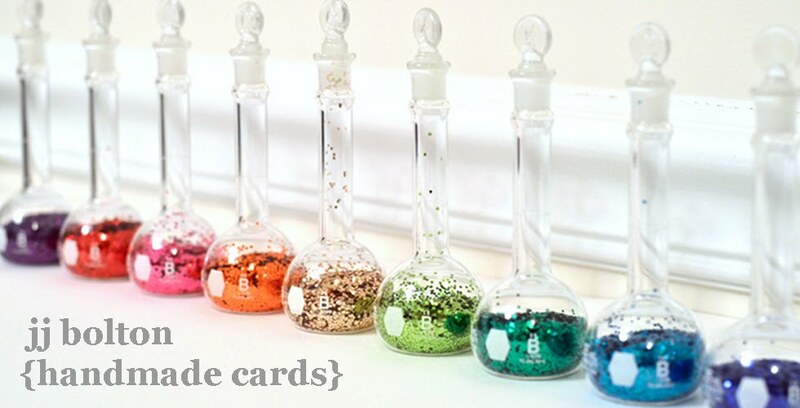 Fantastic cards -- I love the tips on masking and will definitely give this a try! Thanks for sharing! Fabulous and so wonderfully creative! Two cute cards, love the tips on both. Thanks! LOVE both of your cards!!! You have inspired me to try both techniques, thank you!!!! Awesome cards JJ!! I LOVE how you did the second one!! That is sooo cool!! Wow! I have to try these techniques! Love your cards! Guess which one is my favourite? How do you NOT have heart dies?? That seems....weird. And I love the first one too - even with the bit of pink it's still not girly :) You rock! Both cards are FABULOUS!! GREAT rainbow HEART! 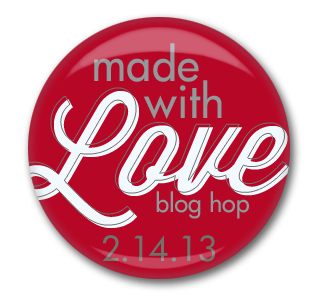 You're my FIRST stop on the blog hop! 1st card - HOW COOL are those vellum-backed letters?!? I've never seen that before. Love, love, love. 2nd card - just how nervous were you stamping that sentiment?? Even the in-progress photo looks wicked-cool. Such a fan!! Totally ♥ your first card -- so CAS and classy! And the heart on your second card is brilliant! Thanks so much for sharing these, and Happy Valentine's Day! thanks for the directions on making the heart. I haven't used the roll tape but it will be on my next shopping list. oh my goodness, so cute, love the vibrant colours of the masked heart! Clever designs. The heart reminds me of a colourful Union Jack ! Love it. I love that its not the traditional valentines colors. Its sooooo pretty! Fantastic cards! I've never heard of post-it label roll tape. Now I've got something else for my 'to buy' list. That inked heart looks incredible! So cool of you ladies to do this! That heart card is too cool. Bet that was FUN to make. And I couldn't help but think of the Union Jack, which is, of course, a perfect graphic design. Awesome cards! Amazing amount of detail! Thanks for sharing your beautiful work. you are amazing, JJ!! these are fab! JJ thanks for the wonderful idea/ tutorial, your cards rock!!! LOVE these JJ.....So Perfect in every way!!! Your cards are wonderful! I love them! Both cards are so unique! Awesome job! Great cards! Super cool technique on the second one! Wow you are so talented...love the use of vellum on your first and the heart is amazing. Love the rainbow of colours. Girl you are amazing... these are STUNNING..that heart is so awesome.. great post.. In love with both projects, JJ! They are absolutely you! How gorgeous is that colorful masked heart??? Both cards are Fabulous, love everything about both! Love the gray with pink & red! And the burst of colors on the second just makes me smile! I love that heart--wicked clever!! I can't wait to try it! Great Valentine cards! I also fell for that Hero Arts background stamp with the ink dots, and just bought it about a week ago! Love it! Beautiful cards. Love the simplicty of the first one and the colors. I just got that Hero Arts background. Now I can't wait to ink it up! Gorgeous cards! Truly love how you masked the second card! Looks awesome! WOW, fabulous cards! Happy Valentines Day! Both cards are gorgeous. I really like the bright one. I don't have any heart dies either! Every year I struggle but I don't have any but then it doesn't bother me until Valentine's Day comes once again! Truly love your card today JJ! love the heart card. so cute! Beautiful cards...and that heart one just really impressed me! Love the bold colors and great design! Thanks for that tutorial! I have to try it. Great cards - love them both. I think I need that Hero Arts stamp now! That heart is insane..love it!! Love both cards. Especially enjoy the bold use of color. Both of you cards are just amazing! So clever and perfect for Valentine's Day! I had to pin your colored heart technique because it was so helpful and such an awesome idea! I have never thought to stamp the same background twice but with different colors! Duh! How fab is that?!! Two thumbs up! Absolutely LOVE these cards JJ! The die cuts with the vellum background are fabulous - Love that it's not too girly too. I think it's a good thing you don't have heart dies because the heart you created is AMAZING!! Cute cards, love the HA background on the first card. Great idea about masking the heart. Thanks for sharing. wow these are fabulous!!! I LOVE that heart and your how to photos! Gorgeous and bright! Very cleaver idea with the heart! Love you first card too. Very pretty! FABulous! Love your colour pieced heart! You know I love your work...love the diecutting on the first card and holy smoly....love that heart card! Great cards. I love the colored heart. Love the heart it looks stained glass!! Beautiful!! The die cut love with vellum is great. Your cards are beautiful. VERY impressive! I love the vellum and the bright colors and the wonderful background and the use of dies, too. Thanks for the tip on making the multi-colored heart. Why didn't I think of that? Awesome....love that spotty background and that rainbow heart is incredible! Wow I just love the rainbow heart card, it turned out just awesome, this is something I will need to make very soon. Thanks for sharing your two cards. LOVE your LOVELY cards! Classy and colorful! JJ, these projects are brilliant! 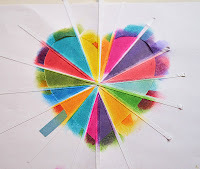 I adore the way you colored the heart project - super fun and innovative! Thanks for sharing! Love that heart - mahalo for explaining the process! These are fabulous, JJ! I love them both! All I can say is WOW! That heart card is just incredible! I love all the colors and that you used scraps! Both cards are very stunning! Thank you for sharing! Love both your cards. That rainbow heart is fabulous. Your first card's background reminded me of the The Matrix (love the movie! love your background!) I don't have any heart dies, either; I was improvising, too... Thanks for sharing how you colored that gorgeous heart! Great cards! Hey sistah, you know that I think you are a genius, right? ;) You use inky techniques like no other! So happy to know you too! :) Hugs! These cards are SO fun!!! LOVE!! amazing cards, JJ. love the bright colors and muted vellum. Gorgeous cards! 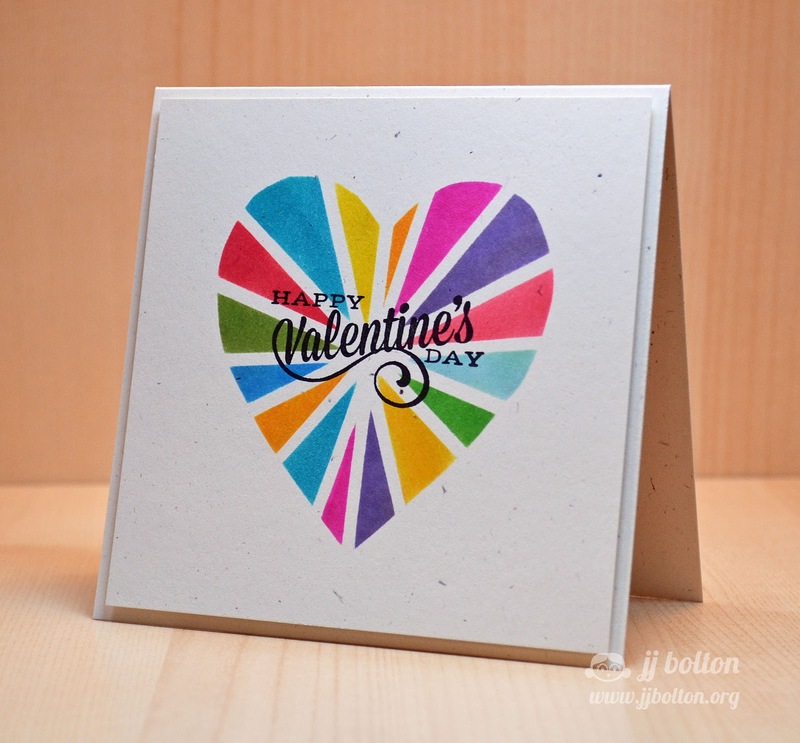 I loove the vellum heart! TFS! Oh my, oh my!!! Can I create like you when I grow up?! I LOVE everything about your cards! Fantastic cards!!! I love the heart, thanks for the directions. The background stamp on the first card is nice but double stamping makes it WOW! I agree that pulling off the mask is the BEST part of creating with masks! Thanks for sharing your delightful projects with us! Finally getting the chance to hop along! Two fabulous cards but the masked heart - WOW, WOW, WOW! Sitting with a cup of coffee on a Saturday morning and I almost spilt it. Wow! Brilliant work, JJ! 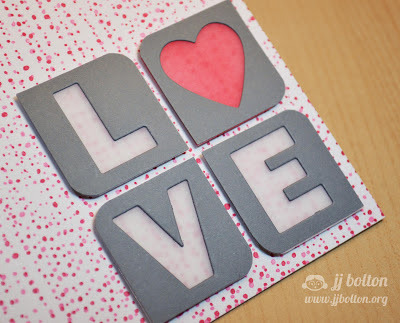 Great sponging and love love the background on the first card. Fabulous cards--I really like your masking technique on the heart card. I love your rainbow heart! Thanks for showing how you created it! Super cute cards! JJ.....INCREDIBLE! I love the vellum backed letters soo much and makes such an impact against that dotted background. Now.....missy. This next fabulous card is just genius! And guess what? I have some of that said "tape" on my desk and now can't wait to use it!!! Genius Genius Genius!!! Thank you for always being so inspiring!!! Hugs! Awsome cards! I love that multi-inked heart! Everything you do is AMAZING!!! Wow - so many messages JJ - Fabulous! Love the heart in so many colors - sort of reminds me of a Union Jack but all the pretty rainbow colors that are your trademark - and the spotty background you double stamped is so pretty too! Me too, me too I love that bkgd stamp too but had to wait for it to come back in stock so only have just got my hands on it!! love that multi colored heart! Beautiful card! I'm going to have to try that and I just love the bright colors! Oh, that spotty background looks AWESOME! I also LOVE that rainbow heart! WOW! Wow JJ, just wow! Your cards are fantastic! I love them both, but your multicolor heart is stunning. Thank you for sharing your talent my friend!! Love your cards, JJ - especially the multi-colored heart! JJ, you are amazing! What a fantastic technique with the Post-it roll tape. I never knew it existed. Now I am on the hunt! Love the masking technique! thanks for sharing. Love both your cards! But my fav is the multi colored one! Gorgeous! AMAZING creations! I just love the vellum letters! I just love the look of vellum, and the way you used it to back your die cuts is fantastic! I really liked both your cards! Thanks for the tip on the post it tape! Wow! That heart card is seriousy amazing! Seriously gorgeous!! Cool masking technique. Especially love the rainbow heart!!! Both of these cards are so fantastic! I love the reverse die cuts and the rainbow heart is super fabulous! Love the vellum behind the letters, and that heart is fantastic! Amazing cards! I love the die cuts on the first and the rainbow is so fun too! FANTABULOUS!!! WOW!!! Both are great but that masked heart has me swooning. Phenomenal!!! !